The exclusive SERPA lock on the CQC holster automatically engages the trigger guard as you holster your handgun and won't let go until you release it. To release, just press the lock device on the outside of holster with your trigger finger. The unlocking device is positioned right where your finger naturally rests. There is no awkward middle finger release or thumb break to slow you down. Unique speed-cut design allows for smooth draw and easy reholster without slowing you down. BLACKHAWK! CQC (Close Quarters Concealment) holsters and accessories SERPA Technology is a simple-to-use active retention system that automatically locks the weapon as you holster it. Adjustable fit belt loop enables the ideal fit for belt sizes up to 1.75". This customized fit option actually keeps the holster in proper position for natural draw and optimum comfort. Looked forever to find a left hand holster for my pt111 gen 2 taurus. I found it new at a pawn shop. Fits my weapon perfectly even though it was made for an H&K ups weapon. Has pointer finger active retention and adjustable passive retention and made of black carbon fiber. Has adjustable cant and comes with paddle and belt loop options. Great holster. I looked all over for a good, secure Ruger SR9 that I could use at the range.Either they were cheaply made or would break the bank, there was no in between. I found this one, and it is pretty much the only one. Not big like my duty holster, so it is no issue to take to the range. Yet it securely holds the pistol through all kinds of drills. And the paddle doesn't pull off when drawn so you are fighting that. And if you are really worried about that, it also comes with the belt loop attachment you can swap it to. Can't go wrong with this one. Better than advertised. Looks great and is comfortable all day. Outstanding fit for my P95. Love it. Very nice holster! I have had this holster for 2 years now. I have not had any problems with it. It is a great piece of equipment to have. I've had this holster, along with all the extra pieces duty jacket slot backing, paddle and belt loop, shoulder harness, etc for a while. The only problem with it is that its cut short, no protection for rear sights. The level2 solves that issue. The original one works fine for plainclothes operations. I've been using this hoster for almost three years now and found it to be the best I've ever had. Easy to draw, easy to reholster, and easy to retain. Q: Will this fit my Springfield xd 45 with a five in barrel? A: "This holster will only fit the XD with the 4"" barrel." Q: Does this holster come in a lefthand model? A: Unfortunately we only have these in a right hand model. Serpa makes mostly Right hand holsters for these. Q: "I have a Springfield 45XD with a 5"" barrel. Will this holster work with this pistol?" A: "Unfortunately this holster won't fit your 5"" barrel. It is made for the XD model with the 4 1/2"" barrel. " Q: Is this holster compatable with a Ruger P95? If so, Which model? A: Unfortunately, the BlackHawk CQC SERPA Holster with Matte Finish is not compatible with any Ruger pistols. Q: "Earlier I sent you an email concerning the fit of my Springfield xd 45 with a 5"" barrel. Now I have a question about double mag pouches. I could not find where you had one for the springfield mag. Do you and if so how much?" Q: will this holster fit a sig sauer 226? Q: Is this holster compatible with the Smith & Wesson Sigma 40? 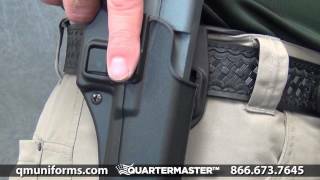 A: Unfortunately, the BlackHawk CQC SERPA Holster, Matte Finish is not compatible with a Sigma 40. A: Yes. The BlackHawk CQC SERPA Holster, Matte Finish will fit the Glock 26. Specific Item number is S69 1152. Q: Will this holster fit my 2 1/4 inch duty belt? A: "Yes, the BlackHawk CQC SERPA Holster, Matte Finish is compatible with 2.25"" Duty Belts."